Home AHB bursa_master A SLEEPING BEAUTY AWAKENS !!!!! A SLEEPING BEAUTY AWAKENS !!!!! This week, BSKL has seen rising interest in the EXPORT based counters as the MYR had significantly weakened against the USD this week alone. Recently I had spotted this small cap company; an investment grade, which have been underlooked and undercovered - AHB HOLDINGS BERHAD or AHB (Code 7315), listed on MAIN BOARD, CONSUMER PRODUCTS/SERVICES. In summary, AHB is an international leading office interiors company, which has been recognised for design, innovation, and a range of products known as system MX that provides a fully integrated and highly flexible office interior solutions. I noticed considerable interest starts to build in on Friday where the volume registered a sizeable increase to 8.8 million units which is the year 2019 highest volume registered so far. This positive momentum should carry forward next week ( forbearing instances of the adversity/ negativity of the regional markets sentiment affecting Bursa Malaysia) since it was able to close Friday conclusively at 0.16. I forsee it trending to the next resistance of 0.20 before heading to my personal TP between 0.25 (short term) to 0.35 on the intermediate term. WHY I THINK THIS STOCK IS UNDERLOOKED AND COULD HAVE GREAT POTENTIAL TO RISE FURTHER? I think the above factor has been widely missed by media/IBs/analysts as a whole. Check the below comparison of FY2017 and FY2018 Annual Reports (link below). 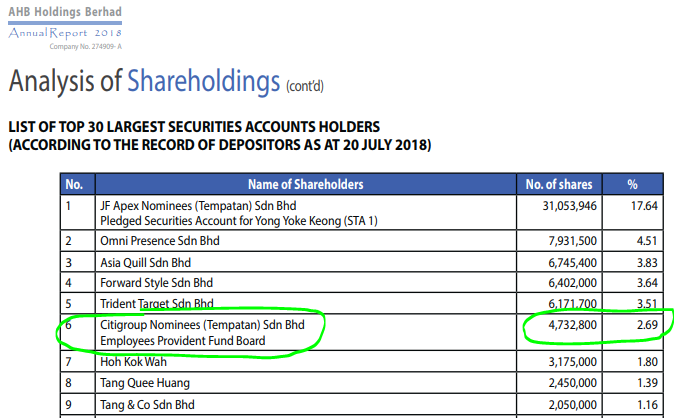 You will find that in FY2017, EPF did not appear as a shareholder but in FY18 report, EPF is listed as number 6 major shareholder at 4,732,800 units (2.69%). As per procedure, a purchase above 5% has to be announced publicly, however since EPF acquired 2.69%, there was no need for public announcement on this matter. I truly believe that this company has very big potential to grow, due to the fact that even EPF known for their strict investment choice, is also believing in the long term prospects of this company. EPF must have done their due diligence before buying into AHB, and possibly should the future look brighter, be adding more shares this year. This is reflective of EPF recognition of the company's future direction. Refer to below image on the exchange rates for USD/MYR taken directly from BNM website. 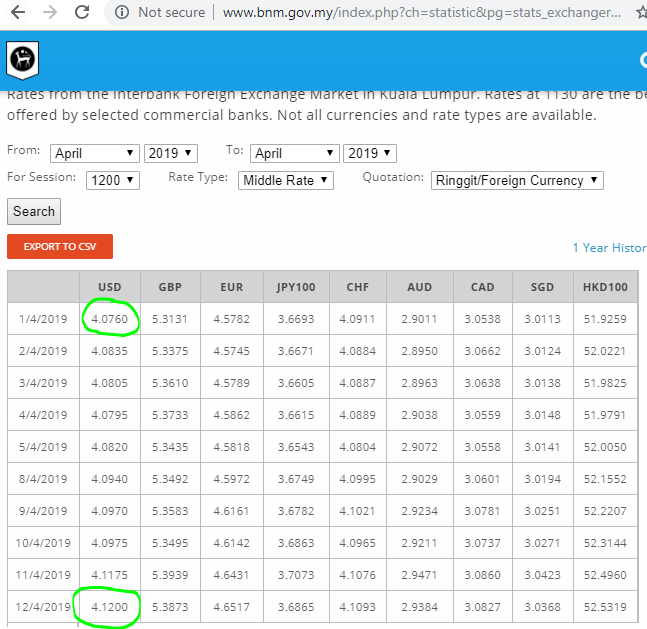 We can see that MYR had started at 4.076 against the USD on 1st April, however started to weaken consistently until 12th April today which stood at 4.120, which is a significant weakening in the span of 2 weeks. From recent quarter report, AHB clients are in the South Eastern Asia, South Central Asia and Middle East. Majority of dealings are international, therefore with the weakening of MYR against USD, AHB should benefit from gaining higher revenue and profit from the currency conversion. Refer to link below for latest AHB Quarter Report published on 22th Feb 2019. AHB had been making consistent revenue and profits for the last 3 quarters. However this is not the part which I want to highlight. What I wish to highlight is that AHB is a debt free company (except small amount owing to directors). Section B7 of the latest QR mentions that "There were no outstanding borrowings and debt securities as at 31 December 2018.'. We can refer below that the total assets of the company is RM 38.462 million (translating into NTA of 0.21) and liabilities stood at RM 1.422 million. 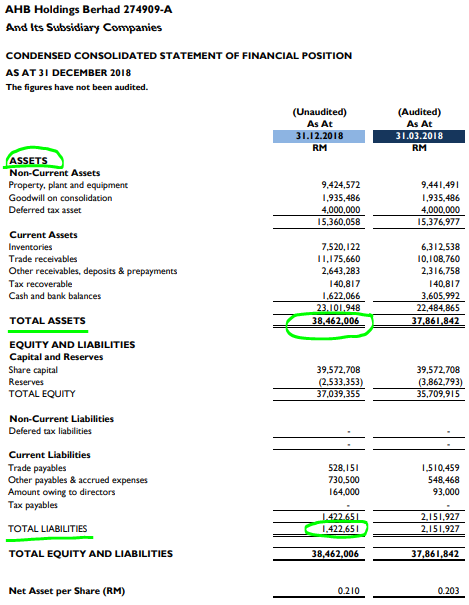 Difference of assets and liabilities is a whopping RM 37.04 million ! From this alone, we can judge that AHB has very low gearing, and could be a potential target of a company wanting to list in BSKL. Therefore, as long as the current stock price is under the NTA of 0.21, it could anytime be a potential takeover target by companies wanting to do Reverse Take Over (RTO). Should the price be able to breach 0.20 level, I foresee it testing the first resistance at 0.25 in the near term, and test 0.35 in the longer term. 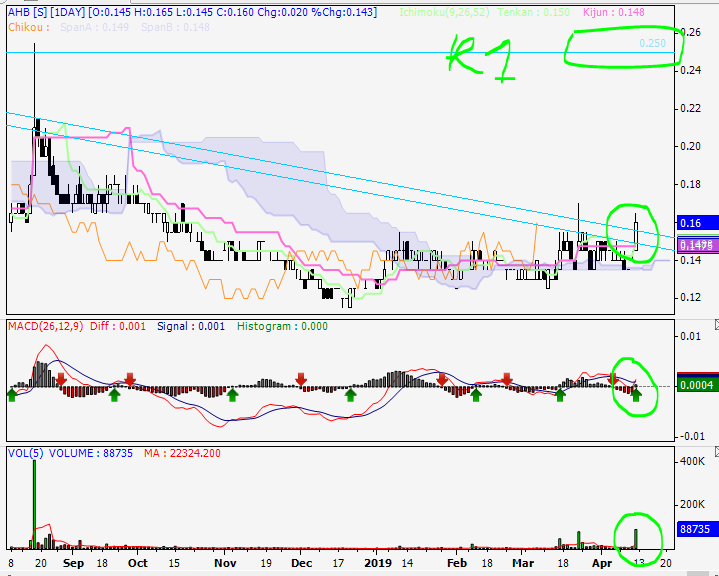 I foresee that if AHB is able to break 0.20 conclusively, AHB WB should be trading at above 0.04 range. Should the mother share hit 0.25, AHB WB should be trading at 0.07-0.12. LET’S SEE HOW THE SHARE PRICE MOVEMENT IN THE NEAR FUTURE FORBEARING ANY GOOD CORPORATE NEWS. I WILL PLACE AHB INTO MY INVESTMENT PORTFOLIO BEFORE FUNDS START BUYING INTO IT. I ANTICIPATE A GOOD RETURN ON THIS INVESTMENT. Disclaimer : The above opinion is not a BUY CALL but only sharing my observations.